The Native Radio Theater (NRT) Project presents three original radio plays, produced at a National Audio Theatre Festival workshop in West Plains, MO in June, 2006. Melba's Medicine, written by Rose-Yvonne Colletta (Lipan-Mescalero Apache) features a Native Grandmother who hosts her own radio talk show and gives out sage advice. Super Indian by Arigon Starr (Kickapoo) is about an Indian with super powers and his side kicks General Bear and Diogi. THE Best Place to Grow Pumpkins by Rhiana Yazzie (Navajo) tells the story of a young girl who helps her grandfather fight his diabetes through a magical pumpkin patch. Funded by the Ford Foundation, NRT is a project of Native American Public Telecommunications and Native Voices at the Autry. Thursday, November 16 at 8 a.m., 1 p.m., 6 p.m. E.T. Saturday, November 18 at 1 p.m. E.T. Sunday, November 19 at 1 p.m. E.T. Twice on Thanksgiving Day, November 23 at 8 a.m., 1 p.m., 6 p.m. E.T. Saturday, November. 25 at 1 p.m.
Sunday, November 26 at 1 p.m. In recent weeks there has been an increase in comments to my blog. For the most part, I’ve left the comments alone as a place for dialog among readers to take place. Periodically, I will respond to a specific comment or set of comments. Today I want to respond to a recurring phrase, in which someone says “I am part Native American” and then goes on to make his/her point. To those who say that here or elsewhere, I urge you to be specific. It is critical that people learn that the phrases “Native American” or “American Indian” are very broad, encompassing over 500 different tribes, each one different from the next. A lot of people write to me, asking if they should use "American Indian" or "Native American" or "Indian" in their teaching. I write back, saying that best practice is to specify the tribe. If you're a teacher in New Mexico, best practice is to teach your students about the American Indians of New Mexico. Apache. Dine (Navajo). Pueblo. Do your part in working responsibly to help everyone know more about who we are. Be explicit. State your tribe. Rylant, Cynthia, Long Night Moon, illustrated by Mark Siegel. Simon & Schuster, 2004. Unpaginated, color illustrations; preschool-2. In the excitement of writing kiddie-poetry about moons and wild wolves and drumbeats, Rylant may not have noticed that the thirteen full moons in the lunar year—by which traditional peoples reckoned the seasons—do not coincide with the twelve months in the Roman year. The two-page spreads—charcoal, pencil and pastel scenes of a house and surrounding countryside in blues, purples, greens and grays—contain visual markers to lend continuity to the poem: a woman holding a baby, a small house, gazebo, telephone poles, fence, large tree, smaller trees. So what are we to make of two polar bears sleeping in March in the hollow of the big tree right outside the fence? Across the country, kids know who Clifford the Big Red Dog is. A long-time favorite in a series of picture books by Norman Bridwell, even more kids are meeting Clifford by way of his television program, broadcast on PBS. In the book Clifford's Halloween, Emily Elizabeth is trying to figure out what Clifford will be for Halloween. One option is an Indian. That page shows him in a large multi-colored feathered headdress, with what Bridwell must have intended to be a peace pipe in his mouth. 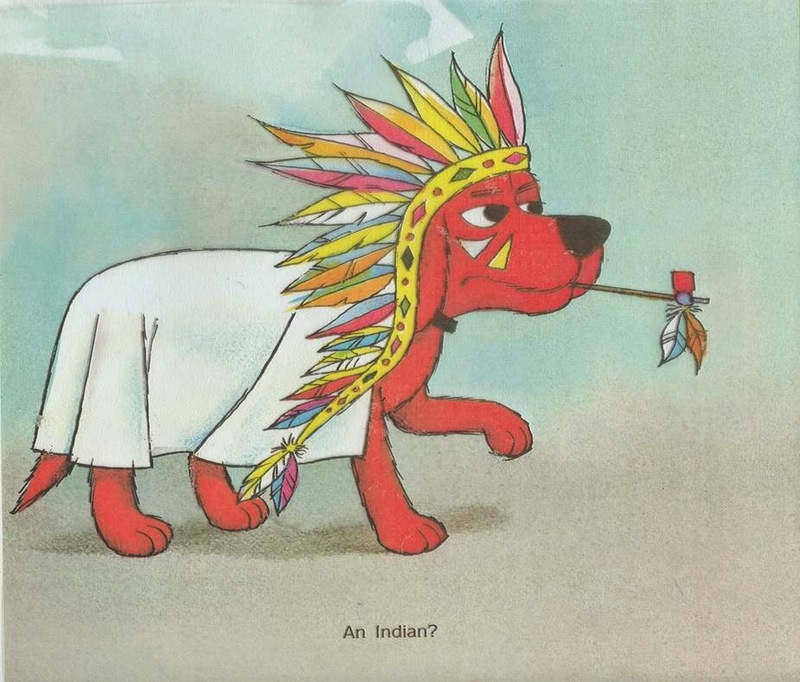 Many books about Halloween have illustrations of kids dressed up as Indians, and due to society's embrace of things-Indian and playing Indian, most people don't give it a second thought. Let’s pause for a moment, though, and think about this seemingly innocent act of dressing up as an Indian for Halloween. What else do kids dress up as at Halloween? I don’t mean animals or superheroes, but people-costumes. They can be policemen, firefighters, cowboys, doctors, nurses, pilots, astronauts, baseball players, cheerleaders... All these are occupations or positions one can, in fact, be at some point, with the proper training. Now---what about an Indian? You can’t train to be an Indian. You can’t become one. It is something you are born into. Another question to consider: What sort of Indian are we encouraging children to be when we endorse an Indian costume, and what does it teach them? Are they savage Indians, the ones who, according to history books, were murderous, bloodthirsty killers? Or are they the tragic ones, heroic, last-stand, looking into the sunset, riding away despondent over loss? In either case, the costume they wear is stereotypical. And—savage or heroic—both place Native peoples in the past, not the present, reinforcing the idea that we are an extinct people. If the book you select for a Halloween read-aloud in storytime has characters that dress up as Indians, turn that illustration into a teachable moment with your students. And, if you’re the parent of a child who wants to dress up as an Indian, talk with your child about that choice and what it means. In choosing NOT to think about this, are you, unwittingly, fostering the development of stereotypes?